Mouse always has his eye on odd things; things of interest. Never before had he seen a plaque by Anton Lang. He came across two in one day. Anton Lang was born in Germany in 1875 and died in 1938, and in his time he was a bit of a celebrity (a bit like Mouse). Anton was even on the front cover of Time Magazine (17th December 1923). I think Mouse is secretly jealous of this. 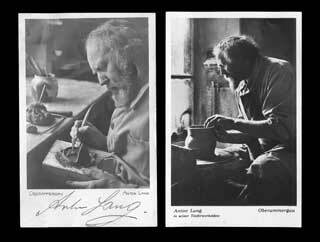 Lang was a controversial figure but a talented potter. Not only was Lang a studio potter but also an actor, "he became as well known for playing Christ in the Oberammergau passion plays as for his pottery" said Mouse knowledgeably. The New York Times dated 2nd April 1922, spoke about at least 100,000 American tourists going to Europe that year. "Remember", said Mouse, "this involved a trip to Germany just after the first World War." The local inhabitants, including Anton, would open their homes to the visitors, and in the New York Times, it mentions that there was some competition to stay at Anton’s. In all, Anton Lang played Christ three times, in 1900, 1910 and 1922. Anton toured the US during 1923 and 1924. Although he probably never actually worked for Rookwood, Mouse says that when he passed through, he would throw pots at the factory. These bear both the Anton Lang and the Rookwood mark. 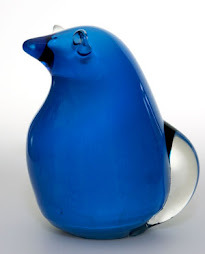 All pieces by Anton have a special quality, as alive and as brilliant today as they were then. Mouse admires the first piece. This is really a Christmas wreath, with such nice bright colours, "a little like Holdcroft Majolica" he remarks. The second piece must be something to do with saints and dragons. "But not mice", he sniffs, "it reminds me of Compton Potters’ Arts Guild". 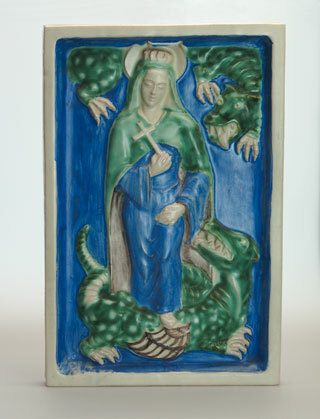 There is a lady and two dragons, perhaps St Margaret, who overcame a dragon when the cross that she was wearing irritated the insides of the dragon, which had swallowed her. It is difficult to be certain when a piece is potted by Anton Lang himself, but, says Mouse, any piece with an inscribed signature is definitely by him. These are from the matt plaque. The inscribed signature is in Anton's hand, the one on the right is a stamp. However the absence of the inscribed signature does not mean it is not by Anton Lang. 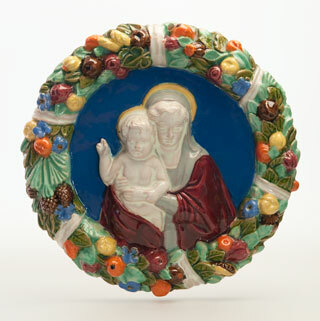 The majolica piece is probably by him too as we know the provenance of these pieces but only has a stamp. Mouse also showed me a strange kneeling Bishop faience candlestick piece. Weird, I said. Do you know what it is? "Nope", said Mouse, "but I like it. Signed with an N inside, difficult to tell if it is Rouen, Nevers, Nimes, Sevres, Nidervilliers, Naples….."
This item will be on sale shortly at Style and Design. Is there anyone out there who could tell Mouse what this is? "In these days of changing values and the state either against religion or indistinguishable from it", said Mouse, "religious iconography is one to watch". "I’ve put my money on it" he said and then started on his cheese and biscuits.